Leap Motion is a tiny device tracking your hands, fingers, and joints movements to control a computer, device, and even a quadcopter. The product was announced in 2012, and HP started selling computers with the technology in 2013. But later this month, you’ll be able to buy a gesture control keyboard from HP for $99, instead of just the Leap Motion USB device for $75. HP featured Leap Motion in notebooks such as “HP ENVY17 Leap Motion Special Edition”, and this keyboard was actually available previously, but only with some of Hewlett Packard’s desktops, and all-in-one PCs, and you’ll be able to purchase it separately. 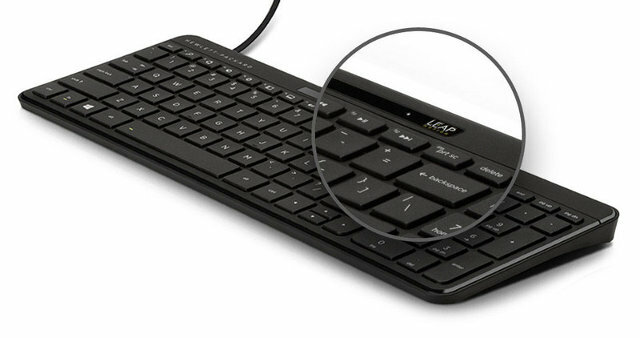 The company says the keyboard can be use with any Windows 7 or 8 computers or tablets as long as you install the software. Leap Motion software is also supported on Linux and Mac OS, so I’d assume it might also work with these operating systems (TBC).